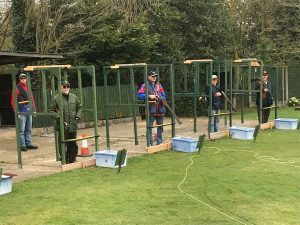 It was a cloudy day but not dull which was excellent for our annual Sport Trap competition on the 25th of March. As Tony Mihill was due to be refereeing along with Trevor Smith, Tony Matthews, Roy Russell and Keith Murray he was squaded 1st and started the proceedings. The 50 bird shoot was laid out over 2 ranges of 25 with range B being the tougher. 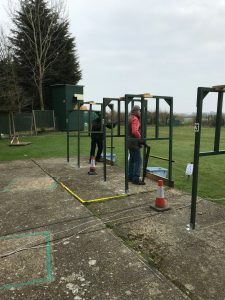 Some of the more regular shooters that take part in National Competitions remarked that Tony Matthews our resident Range Master had laid on a championship level shoot. A quick centre to left incomer caught many people out with the back drop making it look like it was rising more than it actually was. So the 1st squads were out an a very respectable 40 was posted by Tony Mihill to take an early lead and it wasn’t until later in the day that Paul Burrows posted a 38 to be challenging him. As always Barry Dobbs was behind the counter organising the squads and Deidre was making sure all of the members and guests were fed and watered. Many Thanks to you both. A great days shooting was had by all and a big thank you to all the referees and the SGC Committee for organising the day. Not being one to grumble, has you know, but in my opinion. This Competition was a Club Shoot (not a Open Shoot) and therefore the guests Paul Burrows & Mark Barrows, should not be listed in the results. I would firstly like to offer my sincere congratulates Tony Mihill for his extremely good quality of shooting and concentration with Two round’s of Sportrap. I had the great pleasure of refereeing him. Which I did really enjoy! I must add it was no fiddle! He did TRY to shoot and make sure of the last pair = The T””t missed the pair. I think I was more upset than him. This is a discipline he does not normally shoot. As per the norm he then had to rush and help to referee and help when finished. They pay extra and keep your costs down? Southend Gun club HAS a terrible name for unfriendliness! I might ad in most cases this is actually not so. This should be addressed! But as members you should all help??? Last year at an OPEN SHOOT when non members should be welcomed. I was totally ashamed to hear when all the normal people where working or shooting. A visitor asked several members to referee or run a layout for them. They were told ( I only come to shoot not work)(MEMBERS) To me this is not a good member. To help a little goes a long way. Well Rant over . I stand by every word!